The U.S. State Department has cleared a possible sale of 24 Lockheed Martin-Sikorky MH-60R Seahawk Romeo multirole maritime helicopters to India for an estimated cost of $2.6 billion, the Defense Security Cooperation Agency (DSCA) announced in a statement on April 2. The deal is still subject to congressional approval before final contract negotiations between the United States and India can begin and the price as well as the quantity of helicopters to be delivered may change prior to the inking of the final sales contract. Notably, India has walked away from defense deals in the past as, for example when it recently abandoned plans to procure 16 U.S.-made Sikorsky S-70B-x helicopters, although the purchase had already been cleared in 2014 by India’s Defense Acquisition Council (DAC). The helicopter potential sale would also include 30 APS-153(V) Multi-Mode radars, 60 T700-GE-401C engines, 24 Airborne Low Frequency System (ALFS), 1000 AN/SSQ-36/53/62 sonobuoys; 30 MK 54 torpedoes; 10 AGM-114 Hellfire missiles; 38 Advanced Precision Kill Weapons System (APKWS) rockets; 70 AN/AVS-9 Night Vision Devices, next to other equipment and parts. “This proposed sale will support the foreign policy and national security of the United States by helping to strengthen the U.S.-Indian strategic relationship and to improve the security of a major defensive partner which continues to be an important force for political stability, peace, and economic progress in the Indo-Pacific and South Asia region,” DSCA emphasized in the statement. MH-60R helicopters can carry AGM-114 Hellfires for use against small vessels and land targets, and MK 54 torpedoes for anti-submarine warfare missions, and can also be armed with APKWS 70mm laser-guided rockets. The MH-60R lacks an anti-ship missile in its normal configuration. However, according to DSCA, the fifth-generation over-the-horizon Naval Strike Missile (NSM) will be integrated into India’s MH-60Rs. DAC approved the procurement of 111 armed light naval utility helicopters (NUH) and 24 naval multirole helicopters (NMRH) in August 2018. 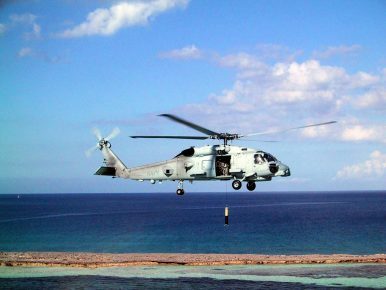 As I reported at the time, the MH-60R Seahawk Romeo maritime helicopter was seen as the Indian Navy’s preferred NMRH option and it was widely expected that the U.S.-made rotorcraft would be selected. The NMRH procurement will be the first major defense acquisition project under new Indian Ministry of Defense (MoD) strategic partnership (SP) guidelines published in June 2017 for a new strategic partnership policy under the framework of the Defense Procurement Procedure 2016. The MoD in February issued a new Expression of Interest (EOI) officially restarting the entire NUH procurement process, following the rejection of the Sikorsky S-70B-x helicopter. The EOI calls for 16 examples to be produced abroad, and the remaining 95 in India. The Indian Navy has a need for over 230 new helicopters, estimated to cost over $10 billion, for its burgeoning fleet. The service currently operates 11 Kamov-28 and 17 Sea King ASW helicopters, although about half of each type are not flightworthy. India’s Defense Acquisition Council approved the procurement of 111 light naval utility and 24 naval multirole helicopters.